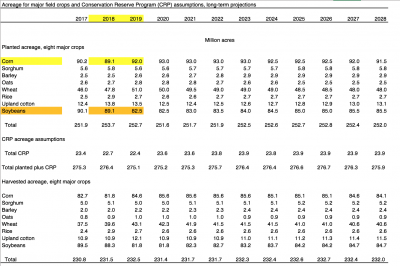 An overview of the 2018 long-term projections is available here, while additional background regarding the development of those projections can be found here. USDA provided an overview of total acreage for major field crops, and Conservation Reserve Program (CRP) assumptions in the following table. 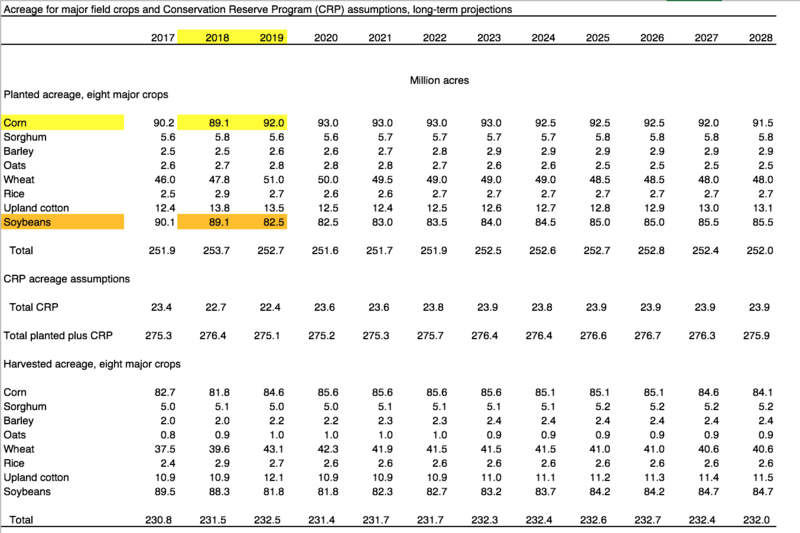 Acreage for major field crops and Conservation Reserve Program (CRP) assumptions, long-term projections. USDA- Office of the Chief Economist (November 2, 2018). USDA estimated 82.5 million acres of soybean plantings for the spring of 2019, down from 89.1 million acres this year. USDA estimated 92.0 million acres of spring plantings for corn, up from 89.1 million this year. USDA also estimated 51.0 million acres of total wheat plantings, up from 47.8 million in 2018. 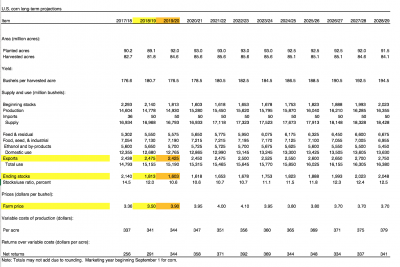 More specifically with respect to soybeans (table below), USDA showed a lower ending stocks number for 2019/20 (723) than for 2018/19 (885), as well as a slightly higher farm price $8.75 (2019/20) versus $8.60 (2018/19). U.S. soybeans and soybean products long-term projections. USDA- Office of the Chief Economist (November 2, 2018). 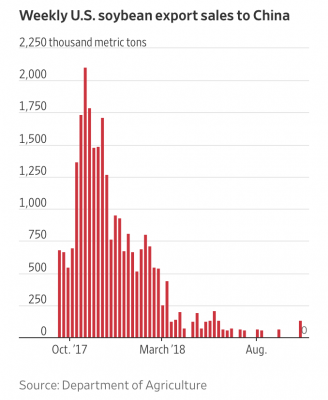 Soybean exports were relatively unchanged in 2019/20 (2,075) from 2018/19 (2,060). 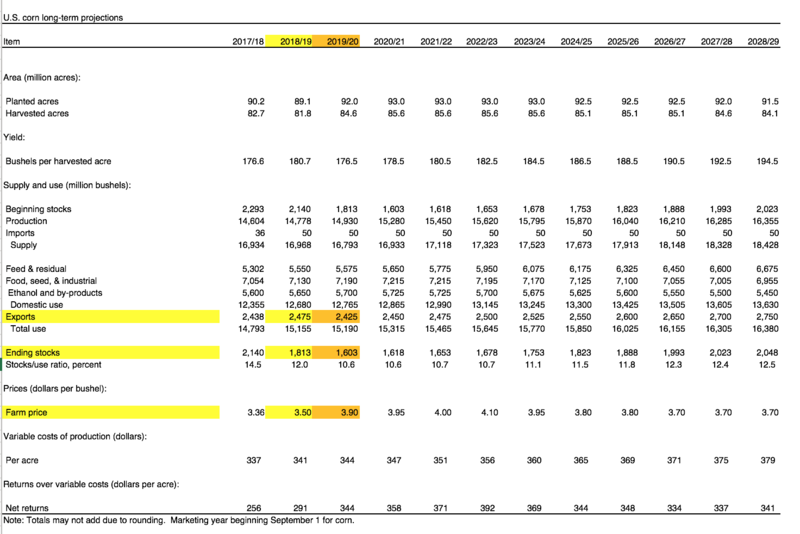 The long-term projections for corn (table below) showed a reduction in ending stocks in 2019/20 (1,603) compared to 2018/19 (1,813), and an increase in the farm price from $3.50 (2018/19) to $3.90 (2019/20). U.S. corn long-term projections. USDA- Office of the Chief Economist (November 2, 2018). Corn exports were projected to be relatively stable. 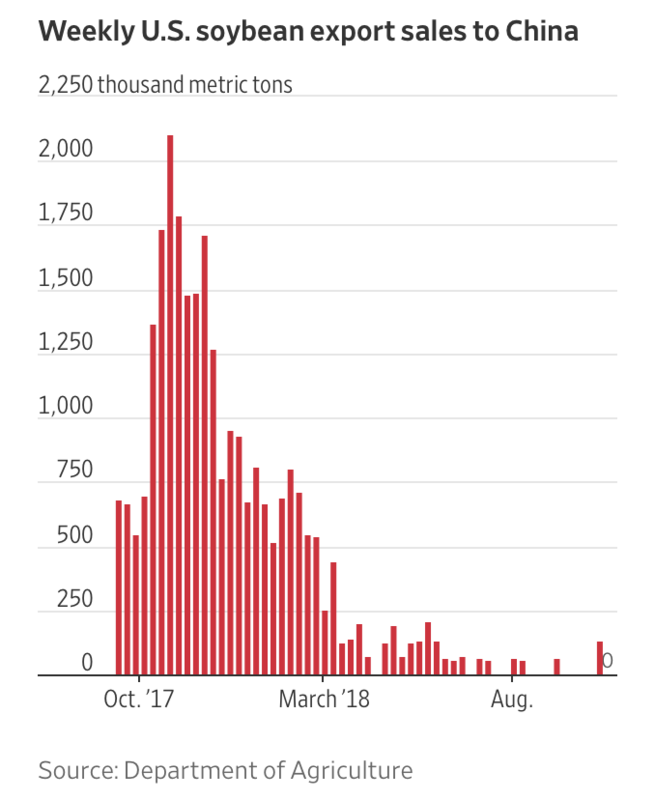 “Tariffs May Crown Corn King Again,” by Jesse Newman and Jacob Bunge. The Wall Street Journal (October 28, 2018). On Thursday, the Federal Reserve Banks of Chicago, St. Louis and Kansas City each released updates regarding farm income, farmland values and agricultural credit conditions from the third quarter of this year.